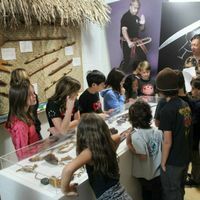 Burbank, CA – As the Martial Arts History Museum celebrates its 18th year, they set their eyes on relocating to a larger location in order to accommodate the growing amount of school field trip requests. 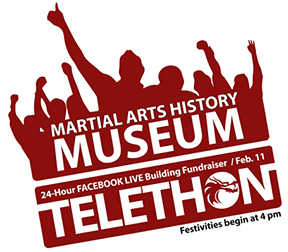 On February 11, beginning at 4 pm, thru February 12, the museum is hosting the first-ever 24-Hour LIVE Telethon to encourage donations for the new facility. Field trips are an important part of growing up. Visiting museums opens young peoples’ minds to different cultures, history, art and the appreciation of diverse societies. “I recall when growing up I went to the Natural History Museum, the La Brea Tarpits and more, at least once or sometimes twice a year. It was a wonderful part of my youth and I gained an appreciation for the arts and our history,” says Michael Matsuda, museum president. The Martial Arts History Museum, located in the city of Burbank, provides a unique opportunity for young people to develop an understanding of the Asian community. Through the hallways of the museum, children learn about the artistry, music, history and traditions of the East and its connection with the West through the martial arts. The 24-HOUR LIVE MUSEUM TELETHON will be broadcast through FACEBOOK LIVE on the Museum’s website for 24 straight hours. Dynamic Dojo Talk Radio is co-partnering with the museum and the broadcast will be live from their Facebook page as well. The Museum Telethon will encourage awareness for the museum plus provide an opportunity for viewers to donate LIVE through gofundme and paypal or call in at (818) 478-1722 to make a donation. Twenty hours of entertainment will grace the live broadcast including martial arts demonstrations, musical performances, comedians, interviews and more. The Museum Telethon will give local artists the opportunity to show off their skills to a live audience via the internet. “This is going to be a huge event for the museum. We are experiencing growing pains at the museum and it’s so unfair when our kids don’t have the opportunity to visit our facility because of space issues. I ask for all of you to view the telethon and make a donation. It will help the kids, it will help the community, it will help our city and it will make an impact for many generations to come. We need new, unique places for our kids to visit and learn about other cultures,” adds Matsuda. The Martial Arts History Museum is a non-profit 501c3 organization and 100 percent of the funds collected will go to the museum. The Museum Telethon will begin at 4 pm on Saturday, February 11 with a special event. The doors will be open for public participation from 6 pm that evening until the following day. “Even if you are not a performer, you can still come to the museum after 6 pm throughout the whole night to enjoy all our festivities. After 6 pm, the museum will be free to the public,” adds Matsuda. The Martial Arts History Museum, which will house the entire Telethon, is located at 2319 W. Magnolia Blvd., Burbank, CA 91506. Visit MAmuseum.org or call (818) 478-1722.